I'm a little uncomfortable about sharing this incident, however, it is part of the story I'm working on right now so I figured I need to add it to my documentation. Dear Pam, that´s the kind of experience we can´t really explain, but it happened, the feeling and the energy within your lived experience in that moment… and the unexplainable sensation that somebody “know” about you, and who you are or what you are doing. weird to explain, right? But at least you know, you are walking right, not doubt. Lucy, I know, its something I carry with me and fortunately there were others there to know it happened. It is unexplainable, or was it just a circumstance. However, I’m an optimist… I believe it was meant to be. I had forgotten that. Not really forgotten but just put it to the back of my mind. I always felt that the cript was older than the cathedral and that that man was linked into something else that I didn’t understand. There was an unusal atmostphere in there. The medieval painted angels on the walls, the shape of the cript, the offering of leaves. I should have looked to see what those leaves were. I have often wondered what that place was before it was a cathedral. It was definately a link to something. I couldn’t stop wondering after reading your post today. That plant in the photo looks like Henbane which is linked to the Celtic God Belenus who’s sanctuary was on this spot. 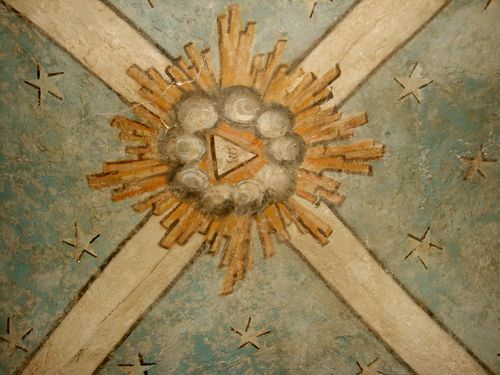 Belenus was called the shinning one, look at your photo of the ceiling, he was often painted as a shinning wheel. Carolyn, Thanks so much for my Birthday gifts, you pick the nicest things and your gifts are so special. The crypt we were in could be older than Notre Dame. Then again it could be the of the artists depiction. Wace, provides a clue as to what might have been going on at Bayeux. The Duke (William) he reports “ordered all the holy records to be assembled in one place. William would have bought together some of the Duchy’s most sacred relics. As to what it means to me… I hang on to the idea that it was special. It makes perfect sense that William would pick an ancient site not only significant to Christianity but to the old religions. The old religions were practised along side Christianity for many hundrends of years and Christianity became of blend of both. People then were very superstitious. Also, France back in Williams time was not the France we know today but a collection of Kingdoms, some very small. Up until the 1900’s not every one in France spoke French but other dialects. As to that day. There were too many synconistic things occuring for it not to be significant. “There are more things is heaven and earth”. Previous PostThe most amazing thing. Next PostBrown paper bag kid.